So you love your long waves, but you’re dying for a change this holiday season. Look to Marion Cotillard and Rosario Dawson for inspiration and try a faux bob! The style is stunning and very simple. Simply pin your length at the nape of your neck for a soft, elegant look. Leave a few layers loose to frame your face, add a thin layer of hairspray and you’re ready to go. For an easy variation on the basic bun, tease your hair. Separate a section of hair at the crown of your head. Next, comb downward, toward your scalp, while you hold the section, until you get enough volume. Cover it in a thin layer of hairspray before you lay it down with the rest of your hair. From here, use your fingers to comb your hair back into a bun. You may need to smooth the teased section down, depending on how wild your hair gets. Play around with this one — you might not get it right the first time, but it’s easy enough to do! Jeweled headbands, hairclips, and combs are great for dressing up a basic hairstyle, especially if you have short hair! You don’t have to try and fit your hair into an elaborate braid or chignon, but you can still create a gorgeous new look. 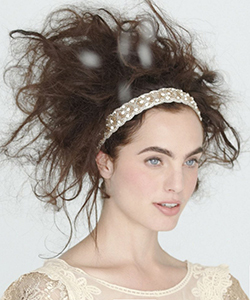 Check out the hair accessories at Anthropologie — they have some beautiful pieces!